Check out the rest of our 26 Best Lakeside Getaways in the Northwest here. We’ll never know for sure how much FDR’s stopover at Lake Crescent Lodge had to do with the declaration that created Olympic National Park nine months later in 1938, but the staff of this venerable North Olympic Peninsula institution still treats everyone like a president, and the experience still delights to this day. Avery and Julia Singer built the lodge in 1915 and opened it for overnight stays and meals soon thereafter. It hasn’t really changed all that much since, with the possible exception of Wi-Fi in the lobby. These days, the lodge has 55 rooms available upstairs from the lobby in the historic main lodge, especially coveted (despite sharing a hallway bathroom/shower). Even better, curl up by your own fireplace in one of the Roosevelt Cabins, which accommodate from four to six guests and come with microwaves and mini fridges, but without the intrusions of a TV or telephone. Likewise, the historic Singer Tavern Cottages offer similar trappings, including lakefront views, but without the fireplaces. The lodge’s restaurant serves three hearty meals a day in summer with a more limited schedule during the off-season. 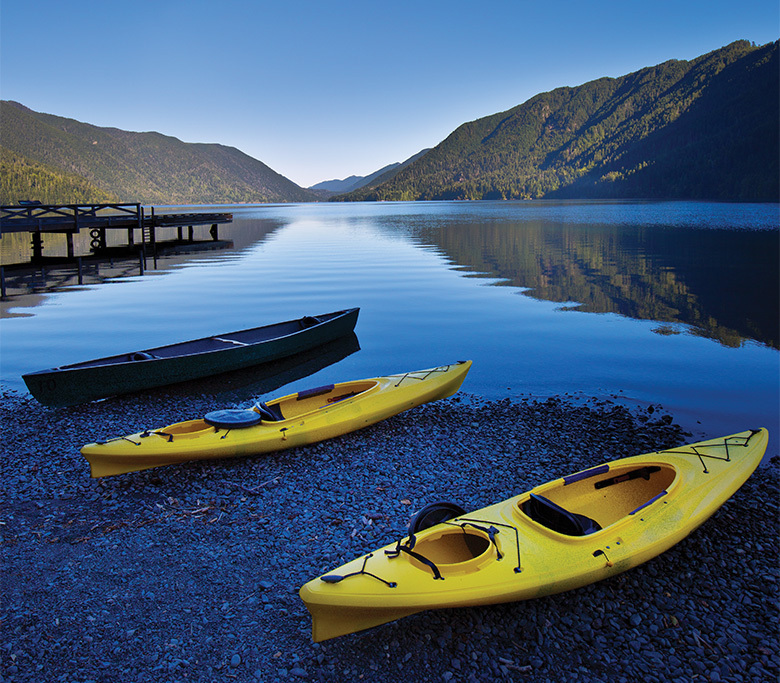 In front of the lodge, rent a rowboat, kayak, canoe, stand-up paddleboard or pedal boat from the boathouse by the shore, and make your way onto big, beautiful blue Lake Crescent; it gets its otherworldly color as it reflects the sky in its clear, nitrogen-deficient waters. Across the lake, Devil’s Punchbowl offers cliff jumpers the chance to strut their stuff into a 100-foot-deep cerulean blue swimming hole on the north shore of Lake Crescent. Hikers will rejoice on the 2-mile “lollipop” (out and back with a loop at the terminus) hike to Marymere Falls, a classic temperate rain forest cascade created where Falls Creek falls off a cliff and horsetails down 119 feet before fanning out into a mossy green amphitheater below. Morning is the best time to be on Lake Crescent, before the predictable daily breeze picks up; it’ll whip you to whatever shoreline it wants, and might make your return trip difficult. GETTING THERE: Lake Crescent Lodge is a three- to four-hour drive from Seattle on the north side of the Olympic Peninsula via a ferry crossing either from Seattle to Bainbridge Island or from Edmonds to Kingston, and then via U.S. Highway 101 toward Port Angeles. Be prepared for some delays due to a three-year project to improve a section of Highway 101 around the lake (check wsdot.wa.gov for updates). Lake Crescent Lodge, Port Angeles, 416 Lake Crescent Road; 360.928.3211; $123–$364.